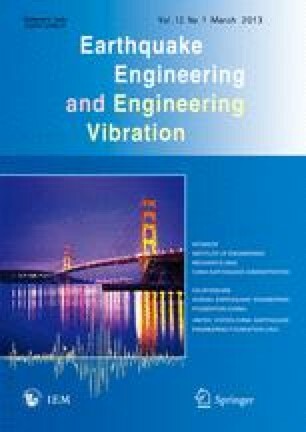 Horizontal impedance functions of inclined single piles are measured experimentally for model soil-pile systems with both the effects of local soil nonlinearity and resonant characteristics. Two practical pile inclinations of 5° and 10° in addition to a vertical pile embedded in cohesionless soil and subjected to lateral harmonic pile head loadings for a wide range of frequencies are considered. Results obtained with low-to-high amplitude of lateral loadings on model soil-pile systems encased in a laminar shear box show that the local nonlinearities have a profound impact on the horizontal impedance functions of piles. Horizontal impedance functions of inclined piles are found to be smaller than the vertical pile and the values decrease as the angle of pile inclination increases. Distinct values of horizontal impedance functions are obtained for the ‘positive’ and ‘negative’ cycles of harmonic loadings, leading to asymmetric force-displacement relationships for the inclined piles. Validation of these experimental results is carried out through three-dimensional nonlinear finite element analyses, and the results from the numerical models are in good agreement with the experimental data. Sensitivity analyses conducted on the numerical models suggest that the consideration of local nonlinearity at the vicinity of the soil-pile interface influence the response of the soil-pile systems.